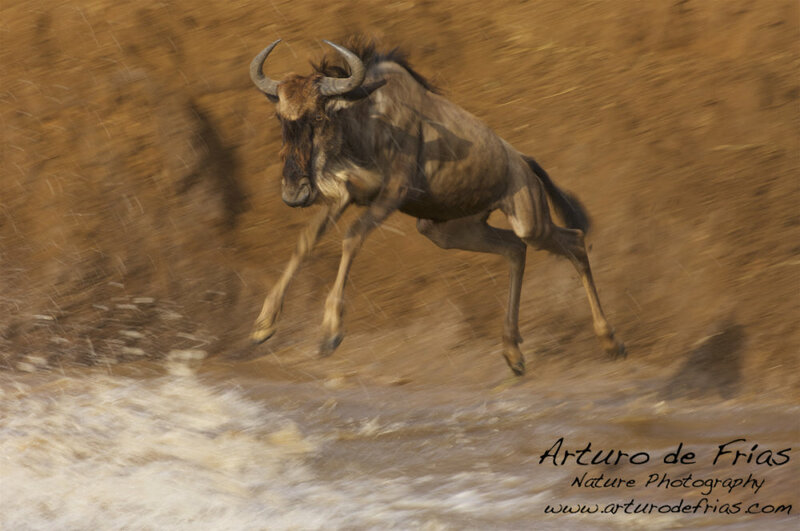 Wildebeests (Connochaetes taurinus) can spend hours in the Mara riverside before crossing: big herds will run towards the river, stop, and retreat again. And they can do the same several times in the same day before actually crossing. Or they can just stand still by the river, looking at the waters, for hours... Until suddenly, without reason, without warning, one will jump. And then thousands will follow!! Los ñus (Connochaetes tarinus) puede pasarse horas en la orilla del Mara antes de cruzar. Grandes rebaños pueden llegar a la carrera, parar, darse la vuelta, e irse corriendo a la misma velocidad. Pueden repetir el proceso varias veces en la misma mañana. O pueden simplemente quedarse mirando al agua durante horas.... hasta que de repente, sin motivo alguno, uno salta. Entonces, miles le siguen.